After building your app in the mag+ Publish portal, you upload the build to the Google Play Developer Console and publish it. 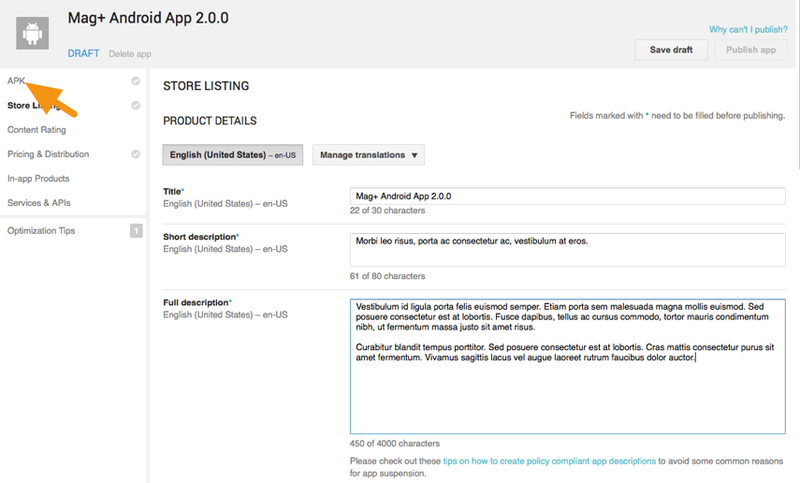 This article will walk you through the process of submitting your app to Google Play. Make sure you have signed up as a Google Play developer and created an app in the Google Play Developer console. 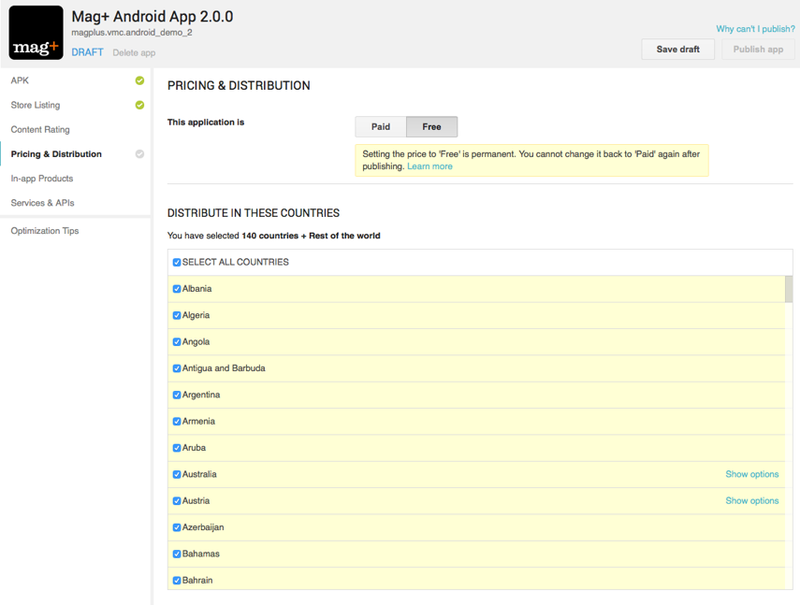 For more information, refer to the "Android" articles in the support section "Setting Up Distribution Channels." Make sure you have created In-App Products for Subscriptions if you will be offering them. 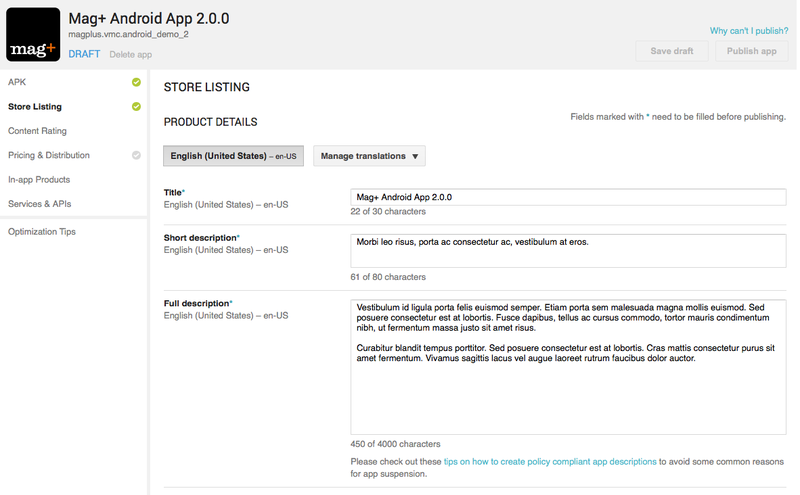 For more information, refer to the article "Android-Creating an In-App Product for Subscriptions." Make sure you have built your app in the mag+ Publish portal. For more information, refer to the "Android" articles in the section "Creating Your mag+ Apps." 1. Go to https://play.google.com/apps/publish and log in. 2. Click on the application that you wish to submit. 3. Click on the tab to the left labeled "APK." 4. 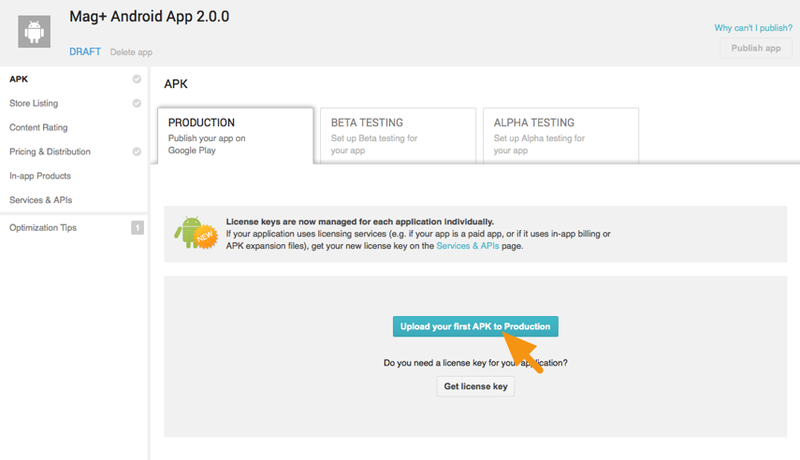 Click on "Upload Your First APK to Production" and then browse to find and upload the ".apk" file you downloaded from the Mag+ Publish portal. 5. Click on the "Store Listing" tab and make sure you have set the required options and uploaded the appropriate graphic assets. Note: For each language you support, you will need to enter the title of the publication, enter a description of the publication, and also enter promo text. Application Type set to "Applications"
6. Click on the "Content Rating" tab and click on "Continue" to fill out the content rating questionnaire. 7. Click on "Pricing & Distribution" and make sure the appropriate options are configured. 8. Click on "In-app Products" and make sure the appropriate options are configured. Note: In order for Subscriptions to be available within your Android app, you must also add a Subscription in Mag+ Publish. In Mag+ Publish, click on the Subscriptions tab, create a new subscription, and enter the Google Play Product ID you create within the Google Play App settings for In-app Products. 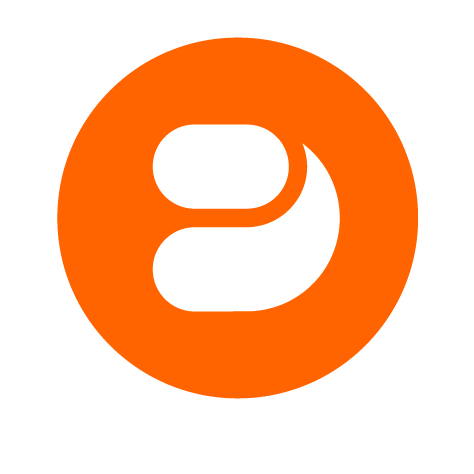 Note: You must create Product IDs for each issue or subscription you wish to make available in your Android device. You create the Product ID in Google Play and then enter that Product ID in your issue and/or subscription packages within Mag+ Publish to make a connection between the two. 9. When you have configured all options in your Google Play app, you may click on "Publish App" to submit it to the Google Play Store. 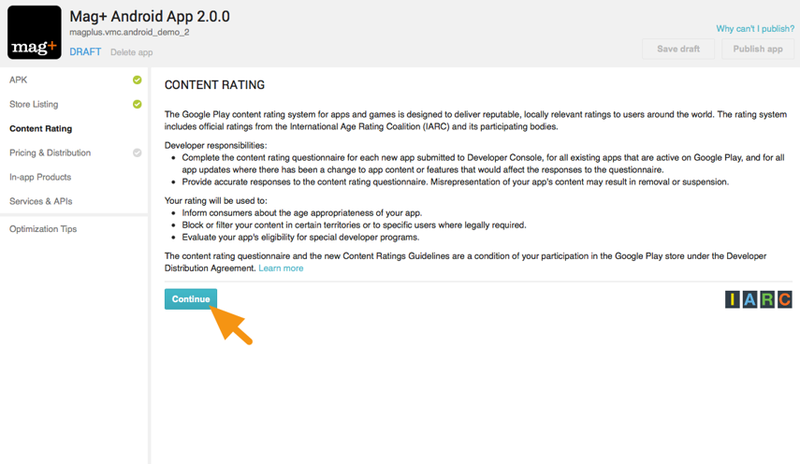 Note: Publishing an app in Google Play submits it to a review process. The average processing time is a few hours, although it may take up to 24 hours to get listed in the Google Play Store. In order for your Mag+ Issues to appear within your app, you must upload a MIB to your Mag+ Publish Issue and publish it there.